What exactly happened the night U.S. swimmers Ryan Lochte, Gunnar Bentz, Jack Conger, and James Feigen claimed they were robbed in Rio? Well, Brazilian Judge Keyla Blanc de Cnop is trying to figure that out. Judge Blanc de Cnop isn't sure about the swimmers' testimony, and recently stated that the police in Rio need more time to figure out if the U.S. swimmers provided truthful information in the wake of the alleged robbery, according to CNN. That's why, on Wednesday, Judge Blanc de Cnop barred swimmers Lochte and Feigen from leaving Brazil (The Los Angeles Times reported that it was too late — Lochte had already returned to the United States). So, why did Judge Blanc de Cnop want Lochte and Feigen to stay in Brazil? Well, it turns out the two swimmers' testimonies don't quite add up. According to CNN, Lochte told police that one robber had approached the group of swimmers, whereas Feigen claimed that multiple robbers were involved in the incident. However, the judge is not only skeptical because of discrepancies between Lochte and Feigen's testimonies — Judge Blanc de Cnop is also confused by the athletes' reaction to the events. CNN reported that the judge stated, "It seems the alleged victims found their physical and psychological integrity were unshaken, even fooling about with each other," after watching video of the swimmers' return to Olympic village after the robbery. And in a somewhat shocking development on Aug. 17, Brazilian officials declared that Lochte lied about the robbery story. According to CNN, the Daily Mail obtained the video of the swimmers' returning to Olympic Village after the alleged robbery, and there's another confusing detail confirmed in the video: The swimmers still had valuable items with them (such as their phones and watches), items which one would assume the alleged robbers would have taken. Although Lochte is back in the United States, Feigen has been detained in Brazil, and told USA Today Sports, "I’m just trying to give Brazil what they need or what they want and get out of here." Perhaps Feigen can help Judge Blanc de Cnop clarify what happened the night of the alleged robbery. 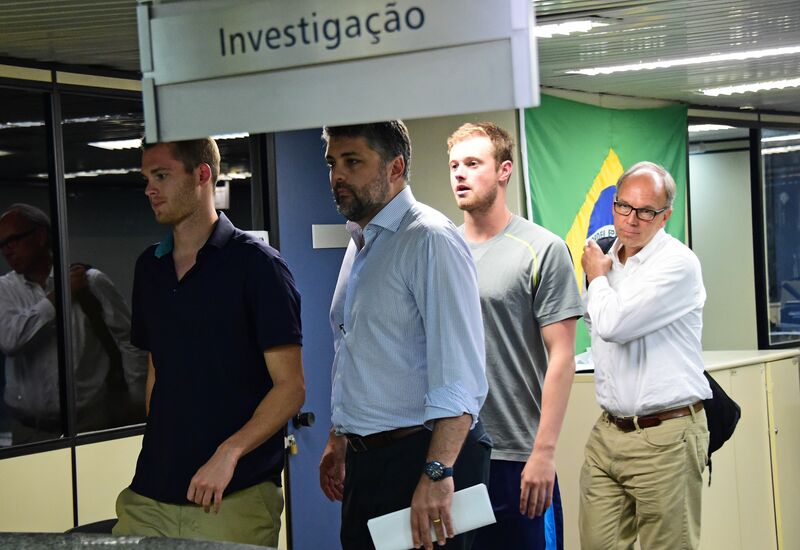 Bentz and Conger are detained in Brazil, too. While Judge Blanc de Cnop's questions make sense, it remains unclear why the U.S. swimmers would have lied about the robbery, or fabricated the incident. However, that must be what the judge is trying to figure out. The alleged robbery is certainly more confusing than it seemed at first, and recent reports claim Lochte may actually have to return to Rio to help clarify events for Judge Blanc de Cnop. Either way, the judge is clearly not through trying to get to the bottom of this case.